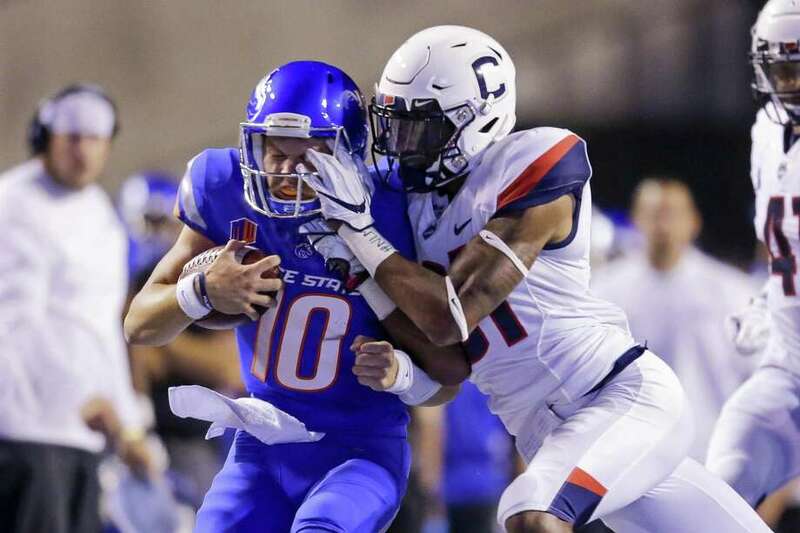 Boise State’s Chase Cord (10) is hit by UConn’s Oneil Robinson during Saturday’s game. BOISE, Idaho — When the 2018 UConn football schedule was released, it would have been perfectly understandable if even the most optimistic of the UConn faithful shuddered just a little bit when looking at the first two games. Losing 11 of the top 14 tacklers from a defense that ranked last among 130 Football Bowl Subdivision programs in passing yards allowed per game during the 2017 season was one thing, but having to open up against one quarterback who finished in the top 10 in the Heisman Trophy voting followed by a showdown against the FBS active leader in passing yardage had the makings of a recipe for disaster. Disastrous might not be a strong enough word to recap just how things went in the Huskies’ first two games. UConn surrendered a program record 818 yards of total offense in Saturday’s 62-7 loss at No. 20 Boise State. The Huskies looked powerless to stop the Broncos, giving up 400 yards on the ground and 418 through the air. Not only are the Huskies 0-2 for just the third time since moving to the FBS level in 2002, but UConn is last among FBS teams in scoring defense (59.0), rushing defense (348.0), yards allowed per carry (8.6) and total defense (735.0). It is also in the bottom three in pass defense (387.0), pass efficiency (217.5), yards allowed per pass attempt (11.6) and completion percentage (76.1). The first quarter was a textbook example of how to make history for all the wrong reasons. UConn was called for four pre-snap penalties including false starts on what should have been the first play in three of the four drives in the quarter. A tipped pass resulted in an interception. UConn was already down 10-0 before registering its initial first down of the game and it was 24-0 after the first quarter. It was 48-0 before UConn had multiple first downs on the same offensive possession. With the exception of Luke Magliozzi averaging 48 yards on nine punts including four boots of more than 50 yards, it was hard to find positives from the most lopsided UConn loss since a 66-10 defeat against Middle Tennessee in 2002. If there is a silver lining it could be that the Huskies may have already faced the two best teams they will play this season. Still, if the costly penalties, poor gap control and missed tackles on defense as well as the inability to sustain drives on offense continue, wins could be hard to come by for the Huskies. “We try to treat every week as the most important week of our season, with our young guys, we have to make sure they stay the course and this is a process,” UConn junior offensive tackle Matt Peart said. “It is something that we have to buy into, when you see your brother going down you have to pat him on his shoulder because we are trying to get back to the UConn football that was here under coach Edsall. Just keeping that in mind, staying together, keeping the brotherhood going. Rhode Island comes to Rentschler Field on Saturday with its first 2-0 start in the Atlantic 10 conference since 2001. Going from playing nationally ranked FBS teams in the first two weeks of the season to an FCS program might seem like it would give the Huskies to take a deep breath. However, the days of games against teams from a lower classification being a guaranteed victory are long game. Since losing to Towson in the 2013 season opener, UConn is 4-0 against FCS competition but the wins have come by a combined 18 points. Sophomore linebacker Omar Fortt was placed in concussion protocol and there’s a chance he could miss the URI game.